The theatre opens 60minutes before the curtain rises. Available from Wednesday 10 September, 2003 at 10:00am. This autumn, the NNTT will invite the Ballet Preljocaj, a ballet company representing nouvelle dance in France, to Tokyo. The company was established by choreographer Angelin Preljocaj in 1984 and is constantly developing creativity focusing on contemporary dance. "Violent" dances that use dancers' bodies to their limits evoke sympathy and a feeling of familiarity in the minds of the audience, as well as depict the vulnerability of being human. The company has taken the initiative in spreading French nouvelle dance in Japan and has influenced many artists in the country. In the forthcoming performances, two works, which were premiered by the Ballet Preljocaj in 2001 and won high praise throughout Europe, will be presented. The company will participate in the "france danse 03" festival to be held throughout Japan. See one of the world's top-notch dance companies demonstrate its powerful dancing! The music is Helikopter-Streichquartett (Helicopter String Quartet), composed by Karlheinz Stockhausen. Six dancers confront powerful, mechanical rhythms created by the sound of a helicopter's rotors and four violins. They dance unrelentingly in the midst of images cast on the floor, and the movements of their bodies constantly try to ascend, becoming increasingly violent. This work was created at the commission of Daniel Barenboim, Music Director of the Staatsoper Unter den Linden. In the past, a number of first-class choreographers have undertaken the choreography of Le Sacre du Printemps by Igor Stravinsky, but Preljocaj overturns previous interpretations of the work and depicts with overwhelming intensity acts that give life to us. His frank and modern choreography combines with the music to captivate viewers. 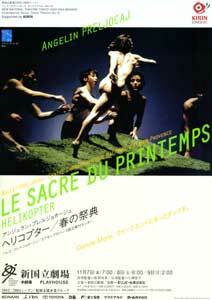 Le Sacre du Printemps is a high-profile dance work that has already won critical acclaim: "It is wonderful in all respects. It captures the hearts of the audience with overwhelming power." Angelin Preljocaj was born in Paris in 1957. After working with Dominique Bagouet's ballet company, he established his own ballet company in 1984. The following year he won the Ministry of Culture prize at the Concours International de la Choregraphique a Bagnolet for his first choreography Marche Noir (Black Market). The Ballet Preljocaj is now based at the Centre Choregraphique National in Aix-en-Provence and is touring the world with its repertoire consisting of Preljocaj's works. His creations cover a wide range of areas, including providing choreographies at the commission of the Ballet de l'Opera National de Lyon, Ballet l'Opera de Paris and New York City Ballet.